Whispers in the Loggia: "The Church Herself Begins"
“This is the day the Lord has made! 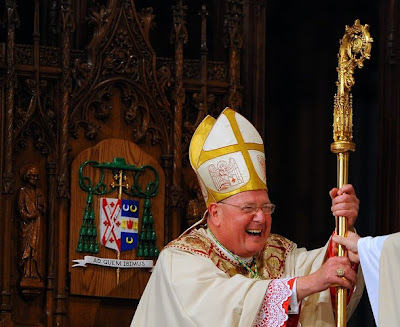 You are all so very welcome here, in this “Cathedral of suitable magnificence,” as Archbishop John Hughes, whose cross I wear today, termed it, that has been such a warm, embracing spiritual home for untold millions. My dear family . 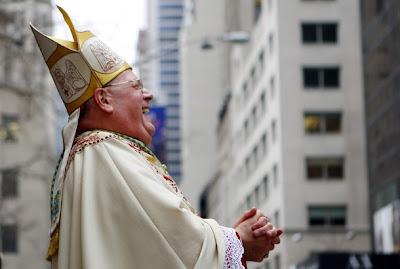 . . when I told Mom that Pope Benedict XVI had appointed me Archbishop of New York, I remarked, “Mom, whatever God gives me in life, His greatest gift to me is that I am Bob and Shirley Dolan’s son.” I mean that. And I’m so glad Mom is here this afternoon . . . especially because there’s a sale on at Macy’s! The Resurrection of Jesus is so central to our faith that we celebrate it every Sunday at Mass. 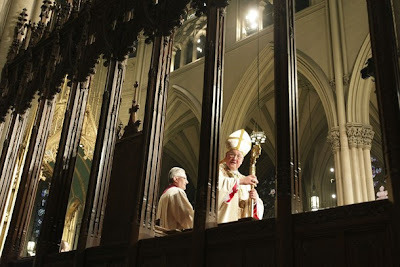 On my first day as your archbishop I dream that we can reclaim Sunday as the Lord’s Day, anchored in our faithfulness to Sunday Mass, our weekly family meal with the risen Jesus. In thanking God for the Resurrection of Christ, we thank God for the Church. For as “Jesus is the human face of God,” as Pope Benedict XVI often reminds us, the Church is the human face of Jesus. That’s the Easter message the Church is entrusted to live and to tell. For, believe it or not, the dying and rising of Jesus continues in His Church. -- In the welcome given to countless immigrants, like even my own great-great grandparents, who came and still do come to this country through this city with little or nothing of earthly value, but tenaciously clung to that “pearl of great price,” their faith, to find in the Church here the spiritual counterpart of Lady Liberty, Holy Mother Church, who welcomed them, embraced them, settled them in, taught their children, and kept that faith alive. [Spanish:] Hoy agradecemos a Dios por la gracia de nuestros hermanos y hermanas Latinas, cuya presencia es una gran bendición en esta arquidiócesis. A ustedes, hermanos y hermanas, prometo dar mi amor, mi corazón, mi energía. Su fe Católica, viva y fervorosa, es una luz para todos nosotros. --The awesome yet gentle might of the Christ’s Resurrection continues in the Church of New York in her faithful people, women and men who love their Church in spite of her wounds, who savor their baptismal call, rely upon the grace and mercy of prayer and the sacraments, live as committed husbands and wives, mothers and fathers, and generous single people, and who bring the person, teachings, and invitation of their Lord to family, community, parish, and the public square, continuing the legacy of such lay leaders as Pierre Toussaint, Dorothy Day, and Governor Al Smith. --The Resurrection of Jesus goes on in our apostolate for the struggling, searching, and marginalized, as thousands of those closest to Christ’s Sacred Heart—the hungry, homeless, sick, troubled, and immigrants--find solace and help in our Catholic charities and healthcare. Conscious are we of former Mayor Ed Koch’s observation that the Catholic Church is the glue that keeps this city together . . . and, and . 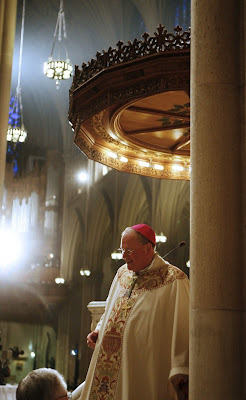 . . the Resurrection goes on, as His Church continues to embrace and protect the dignity of every human person, the sanctity of human life, from the tiny baby in the womb to the last moment of natural passing into eternal life. As the Servant of God Terrence Cardinal Cooke wrote, “Human life is no less sacred or worthy of respect because it is tiny, pre-born, poor, sick, fragile, or handicapped.” Yes, the Church is a loving mother who has a zest for life and serves life everywhere, but she can become a protective “mamma bear” when the life of her innocent, helpless cubs is threatened. Everyone in this mega-community is a somebody with an extraordinary destiny. Everyone is a somebody in whom God has invested an infinite love. That is why the Church reaches out to the unborn, the suffering, the poor, our elders, the physically and emotionally challenged, those caught in the web of addictions. 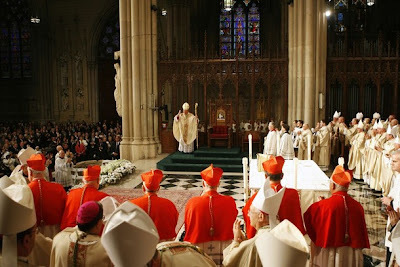 --and, maybe most of all, Christ remains present in His Church as people whisper prayers, worship at Sunday Mass, struggle with sin and pursue virtue, hunger for God’s Word and Sacrament, and realize that, as much as we love New York, we have here no lasting home, for our true citizenship is in heaven. Now, let me bring this home by suggesting that we all take a little stroll down…the road to Emmaus. See, I mentioned to you that the Church continues not just the rising but also the dying of Jesus Christ. 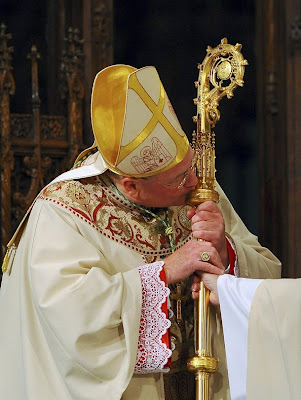 We’ve just been through a litany of ways that the rising of Jesus radiates in the Church in this historic archdiocese. But we’d be naive if we overlooked the dying, wouldn’t we? My new friends of this great archdiocese, would you join your new pastor on an “adventure in fidelity,” as we turn the Staten Island Expressway, Fifth Avenue, Madison Avenue, Broadway, the FDR, the Major Deegan, and the New York State Thruway into the Road to Emmaus, as we witness a real “miracle on 34th street” and turn that into the road to Emmaus?